If you're looking for a panoramic view of the beach and ocean, look no further. This top floor, end unit condo has banks of windows along the side and full length glass sliders across the back. You will have fantastic views of the pier, inlet, shoreline, and of course, the Atlantic. You'll feel as though you're on a boat sailing the sea with so many viewpoints. There is even a view of the ocean from the a balcony in the second bedroom. And as your deck is covered, you can sit out there in the shade, out of the sun and sit there if it's raining (although it never rains at the beach!) Your condo comes complete with three bedrooms and two full baths. The condo has just been remodeled and includes all new flooring, a new smooth top stove, new flat screen TV's, and DVR's. You will have two covered parking spaces under the building and a ground floor storage closet to store all your beach gear. We have a king size bed in the master, one bedroom with a queen bed, and the third bedroom has two twin beds. We also have a brand new queen size sleeper sofa in the living room. Each bedrooms, as well as the living room, has a flat screen TV for your enjoyment. 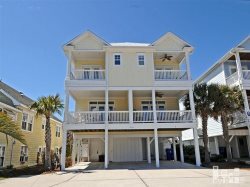 Come stay with us here at White Caps and experience all that Carolina Beach and Kure Beach have to offer: The summer is a special time here and you can enjoy free outdoor music, fireworks, stroll along the boardwalk and try a Britts donut, or head over to Squiggly's for some ice cream. This is the perfect vacation destination for the whole family with loads of fun things to do and see. But don't forget to relax on the beach! The property was great! Beautiful views! The reservation process is easy, and communication via email is comprehensive and timely. I have rented from A1 several times, and David and team are readily available if needed. The view from the third floor is amazing with the big sliding glass door and the windows on the side of the building. Nice floors and furnishings and large enough for our pre-Christmas gathering for 6 adults. Almost everything! The view from the top floor is breathtaking. The beach was clean and uncrowded. The unit was very clean and well-equipped. Very spacious, very nicely decorated. Having a place to store beach equipment on the ground floor was very nice as well. No issues. Easy online reservation process and check in was seamless. Whenever I did send an email I received a prompt response. Unit was large enough for our group. The unit was very clean which is not something you always get with beach rentals. Also appreciated the supplies of paper products and soaps. Loved the deck furniture and enjoyed watching the dolphins. Would have liked a couple more high deck chairs so everyone could take advantage of the view. Kitchen could use a few more items such as mixing bowls and larger fry pans. This condo was way more than we expected has everything you need. My family and I had a wonderful time and look forward to staying here again. Highly recommend for a perfect beach getaway. Great location! The condo was great! Very clean and tastefully decorated! Awake and Ready was the perfect choice for our family vacation. The condo was perfect for our needs and we couldn't imagine staying anywhere else! Worth the 15 hour drive!! We would love to come back and stay in your beautiful home. Thank you for everything! We loved the view! We rose early every morning to see the sun rise over the ocean. It was our daughters first visit to the beach and our wedding anniversary. We loved the colors and the simple design of the condo, its so charming! Loved the condo! We loved the ocean view and spending time on the beach with our extended family. We will always remember our time here on Carolina Beach! So happy we chose to stay in your beautiful condo! The location is perfect, the views are amazing and the accommodations are relaxing and comfortable. We enjoyed sunrise walks, sea turtle nest watching and gorgeous ocean thunderstorms. We enjoyed every moment of our week here and would definitely return. Thanks for sharing your oceanfront oasis with us. We have had a wonderful week here. The condo is beautiful. This is our first time here but we will certainly come again. It was a great week! We had an amazing week here at this beautiful condo! The view alone was worth it all! Best beach week we've had in years. Will come back soon.